Enjoy fishing or whitewater rafting? What about weekend trips? No matter how you want to use a kayak there is a specially designed boat for you. Some are even inflatable if you have limited space to store and transport them. The best kayak will be one that you use regularly so ensure that you have a comfortable seat and are able to carry your boat by yourself. If you decide to get a rigid boat make sure you have a way of getting it to the beach. You can use a kayak roof rack or throw it in the back of your truck. We know you deserve the best kayak so we scoured the web to find just that. These kayaks are the top in their class. This is the best sit on top kayak that comes with a kayak and a portable accessory carrier. Simply grab a paddle and prepare for the best river kayaking experience. This is the best kayak for the money that delivers all the stability you could ask for to handle the unpredictable conditions of river paddling. The open cockpit design gives you even more room to move around with ease. Thigh pads and adjustable foot braces make this kayak sit even more comfortably. This kayak is incredibly lightweight and tracks and paddles with ease making it great for strong river currents. This all around kayak is made using UV stabilized materials which allows you to take it on long paddles without fear of it fading or becoming weak. This will ensure it lasts longer than ever before. Having a paddle holder on board will free up your hands so that you can bring along fishing gear and take to the river. This kayak comes with a PAC, a portable accessory carrier that you can tow behind your boat for added storage. You can also choose to wear this as a backpack in dry conditions. There is also tons of additional storage on board which will allow you to bring all your gear along with you. This impressive package comes with so much, you will hardly believe the incredibly low price. Included you will find your inflatable kayak, two paddles, repair kit, carrying bag and inflatable skeg. This kayak has a 650 lbs weight capacity making it a great option for families and heavy packers. Fitting up to three people you can take this boat through still lakes or brace the ocean surf. This incredibly durable kayak is sun and saltwater resistant making it great for long distance trips. Your kayak will look newer longer without concern of prolonged exposure to the sun or salt waters taking its toll on your boat. This Sea Eagle SE370 inflatable kayak is the best kayak that can support three people and works great with only one, there are two paddles included. These dual sided paddles allow you to switch out who does the work, or are great for families whose kids are too small to paddle themselves. This packaged deal even comes with a spray skirt. This fits over the end of your boat and minimizes the spray you will get from any current. Brave the surf or maneuver down a river knowing you and your gear will stay dry. The included foot pump allows you to inflate your kayak with the ease of a simple step rather than the exhausting hand pump. This allows you to save your upper body strength for paddling on the water. Forever thinking of safety, Sea Eagle even included a repair kit in this package. Keep this handy compact repair kit with you at all times when out on the water for added peace of mind. A carrying bag rounds out this packaged deal. This bag will fit your kayak and keep it in a small bag that is easy to transport. This packaged deal is designed to get you out on the water and keep you there. 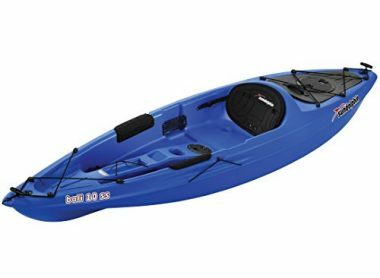 This is the best tandem kayak that includes everything you need to get on the water including two paddles, a pump, and a removable skeg. 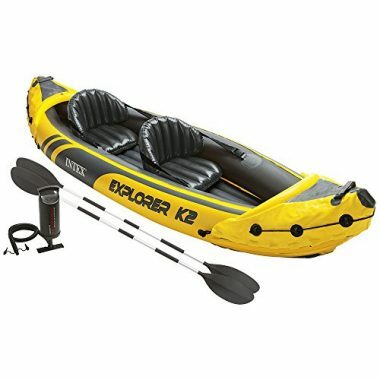 The Intex Explorer K2 Kayak is a highly visible boat that offers a superior build and sporty look. It features a sit on top design that feels open and airy, perfect for hot summer days. The lightweight design makes it easy to transport and carry to the beach while it’s strong puncture resistant vinyl ensures it will stand up to rocky shores. Being inflatable allows you to throw the kayak into the trunk of your car to easily bring it with you even on cross country roadtrips. Included are two high quality paddles that will get you to where you need to go. They are heavy duty and expertly made allowing them to bend and flex in even rough conditions. Its removeable seat is comfortable and adjustable for any sized person while the backrest contours to your body shape making the ride that much more enjoyable. The removable skeg allows you to use this in different water conditions from lazy rivers to rapids. This is the best lightweight kayak comes with everything you need to get on the water. 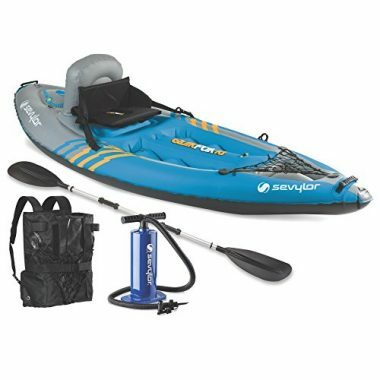 This packaged deal comes with your inflatable kayak, a backpack, a hand pump and your paddle. With an all inclusive package and an excellent design, this kayak has a mere 5 minute setup time which gets you out on the water faster. This kayak excels in durability with a tarpaulin bottom which provides added protection. Multiple air chambers will give you peace of mind that you will still stay afloat even if your boat is punctured. This backpack system is very unique in design as it turns into the seat of your kayak. Multi functional this kayak is built with a compact focus which makes it a great option for those with minimal square footage. This kayak comes with a hand pump and a paddle. This gets you out on the water faster as it has everything you will need. Also coming with accessories such as carrying handles for easy transportation and a cup holder so you can keep a drink close by. This kayak has thought of everything. The Riot Boogie 50 kayak is the best recreational kayak. Made out of a highly durable polyethylene material this boat will stand up to the rocky shores. The fully closed whitewater kayak will allow you to enter even the most aggressive conditions and stay dry and comfortable. This boat can be taken through rapids or even in the high surf of oceans. Its shape decreases the amount of drag and resistance which propels it faster through the water. A simple system of rails and flat back allow you to carry your gear with ease. The mid span seat will give you easy access to the dry hatch in case you want to snap a photo of the scenery around you. The seat is padded just enough to create comfort while allowing maximum stability and control. Even though it is a closed system this kayak for whitewater also features a drain plug that will ensure you don’t take on water while in rough conditions. The cockpit is perfectly sized for any shaped person. Foam blocks allow your feet to have a place to comfortably rest. Also included are easy to use handles which provide grip when hauling this boat to the water’s edge. This is an excellent fully equipped boat ready for any conditions. With a pump, a paddle, a repair kit and your solo kayak all included, you will be out on the water in no time. Find a nice lake or a lazy river and watch as this kayak expertly navigates around the water. This durable boat has been approved by the US Coast Guard for its expert performance. Riding similar to a rigid boat, you will have the stability needed to expertly maneuver down the water. 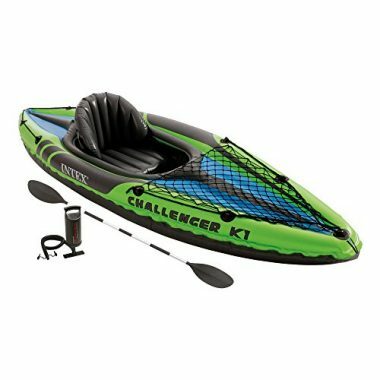 This Intex Challenger K1 1-Person inflatable kayak is the best cheap kayak that is made using UV resistant materials which will allow your boat to last even longer without fading or showing wear. This makes it a great option for long distance paddles. This sit in kayak gives you a spacious cockpit with enough room for any paddler. Welded seams allow this boat the durability to last through many seasons. Puncture resistant vinyl makes this boat a great option for those who are a little rough in their ride or who want to pack a lot of gear on board. Coming with a paddle means that you will be able to get out on the water faster. This 84” paddle has an aluminum frame that allows you to move through the water with ease.This high output hand pump makes inflating your boat even easier. Designed to get the most from each manual pump, your kayak will be ready to ride in a matter of minutes. Lastly, Intex has included a repair kit on board which gives you peace of mind. Great to bring along, especially on longer trips, having the repair kit on board will allow you to fix any weak spots before they become an issue. 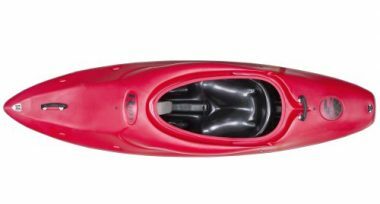 This kayak by Ocean comes individually with one incredibly well rounded kayak with a skid plate. 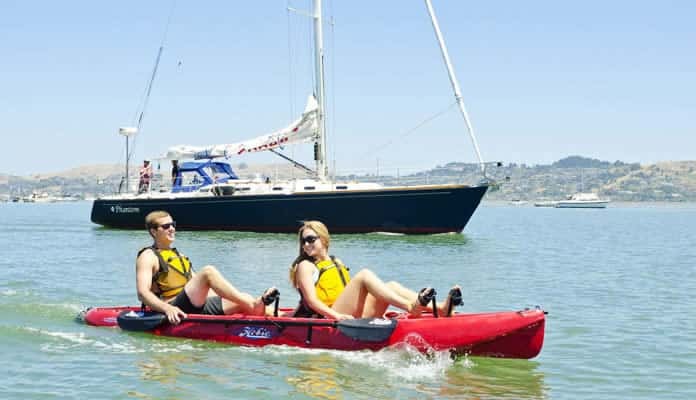 Ocean Kayak Malibu Two tandem kayak is the best ocean kayak that rides tandem fitting up to two adults but can be paddled comfortably solo as well. Durable enough to bring your pup on board or even a child in the third seat, your opportunities are nearly endless. Overlapping foot wells and a spacious cockpit ensures that any paddler will sit comfortably in this kayak regardless of their size. 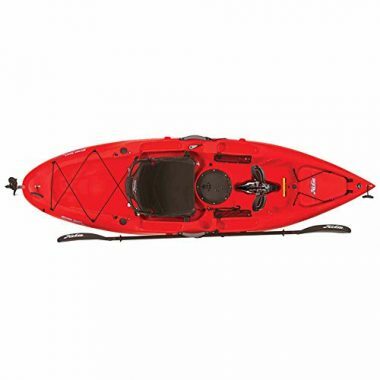 Pack all your gear along as this kayak boasts plenty of storage space for your cargo. This kayak comes equipped with a skid plate underneath. This is an extra layer that protects the underside of your boat from rocks and other materials that can cause damage. This plays a large role in durability drastically increasing your boats life expectancy. The Lifetime 10 foot Sport Fisher kayak is the best fishing kayak that will get you to where other boats can’t. This package includes two paddles and paddle holders. Not having a motor will ensure that you won’t scare away your potential dinner while its sit on top design allows you to throw casts from a sitting, kneeling or standing position. A ten foot length is ideal to store your gear while having enough room to spread out and enjoy yourself. Don’t worry about bringing too much gear as the high 500 pound weight capacity can handle whatever you throw at it. Combined with ample storage space including a dry hatch and bungee system, you will always be within arms reach of your gear. Accessories like paddle clips will secure you most used item to your boat while you throw perfect casts. This will ensure they don’t roll off the deck and float away leaving you stranded. Have more than one rod? 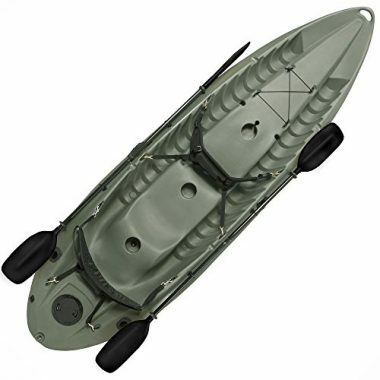 Bring them all as this kayak for fishing has three holders. Use one for trolling and another for casting. You can tell a quality rig by the warranty it comes with. Lifetime includes a 5 year warranty on this entire raft covering everything except normal wear and tear. You can rest assured that your boat will stand the test of time. This is the best sit in kayak that comes as a solo kayak without any accessories but does come equipped with a pilot rudder system. This kayak is built for long distance paddles which is evident in its comfortable design. A custom fit seat in a spacious cockpit will give you enough room to move around with ease. Its long and slender design helps you to cut through the water with ease. Equipped with a pilot rudder system that will help you to navigate your way across the water making your trip that much easier. When traveling long distances it is important to have many compartments to bring all your gear along with you. This kayak is equipped with dual density sealed front and rear compartments to ensure all your gear stays dry. 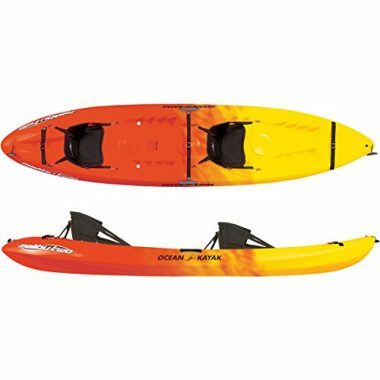 There are many added accessories on this kayak including the most important safety features such as reflective lines, safety straps and a safety bar. A drain plug makes it so that you can take on surf without fear of weighing down your rig. This also comes equipped with a paddle hook which makes it so that you can take relaxing breaks without concern for your paddle sinking into the water. Riot has thought of everything. This is the best river kayak that comes with a paddle, a rudder, and your kayak. The Hobie Sport is a well equipped pedal powered kayak. The comfortable, adjustable seat will keep you positioned correctly for even the longest trips. An advanced push pedal system has shoe loops to secure your feet while pedaling through rough water. The open sit on top style allows you to get up and move around with ease, perfect for activities like fishing. A large bungee storage area directly behind the seat will store everything you need for your trip while the dry storage at the front will keep your prized possessions free from water. This bright kayak with pedals will make any weekend trip amazing. The included paddle breaks down into two pieces making transporting it a breeze. Being able to fit it in your trunk with ease will make kayaking even easier. Two molded-in rod holders make this kayak the ultimate fishing option. Move with your feet, have your line out while your hands are free. More and more people are moving into apartments or smaller homes and driving smaller vehicles. 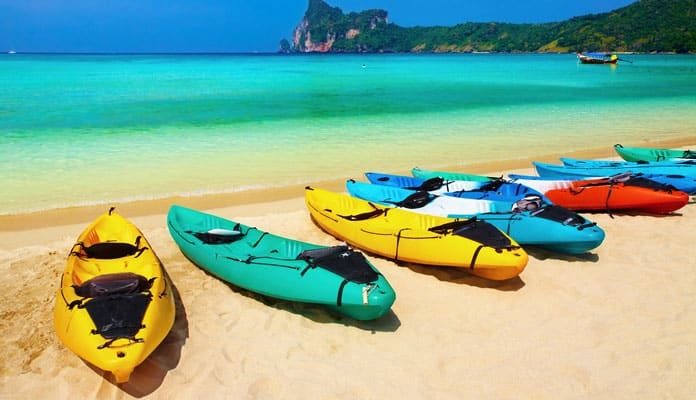 To be able to bring kayaks to more and more people, kayak companies created the inflatable kayak. Being able to carry your kayak in a compact backpack is an incredibly desirable option. For those who like to explore many different lakes, an inflatable boat makes portaging much easier, especially when you have other gear with you as well. Their lightweight design and the ability to deflate between lakes makes them a great option for families or solo paddlers. Inflatable boards are made using a strong and thick material, typically PVC, that allow them to ride similar to a rigid boats. This also gives them the durability to be able to not crack or dent and are strong enough to even hold dogs along for the trip. Inflatable kayaks typically hold large capacities which means they can hold more than one kayaker enthusiast aboard. This backpack sized kayak will inflate into fun for the whole family. Specializing in fun for the whole family, our top inflatable kayak is made by Sea Eagle. Its no wonder it is at the top of our list as one of the best kayak that can be paddled easily with one person but with its impressive weight capacity can support up to three. Many fishermen are turning to fishing kayaks instead of other boats for their comfortable size and their ability to go just about anywhere. Being able to go with a group or plan for solo trips is much more convenient with the small and portable size of a kayak that can be transported even with the smallest of cars. Most fishing boats will come equipped with rod holders. These prove very beneficial if you want multiple lines going or to free up your hands for a cold beer from your cooler. Paddle holders will free your hands and be a life saver when trying to reel in catch. Most paddles don’t float and you do not want to have to worry about where to put your paddle when you’re reeling in a tricky catch. Being in the middle of the lake without a paddle can prove dangerous. Fishing requires lots of gear and you want to make sure your boat can accommodate that with large weight capacity. You may want to pack a cooler, bring an overnight bag with a tent and a sleeping bag, or just pack for all kinds of weather. You will need to have a place to be able to store your gear and weight capacity that will allow the added cargo. Fishing can also be lonely, being able to bring your pup along is an option few would pass up. The top of the line fishing kayak on the market is the Lifetime Sport Fisher. This boat has everything you will need for a great day fishing out on the lake. Do you and your wife or friends love kayaking? A tandem kayak makes it easy for you to bring along your friends and family for a weekend adventure. 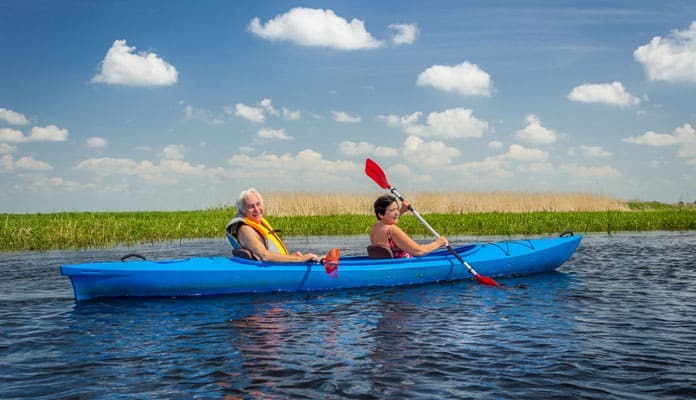 When looking to purchase a two person kayak it is important to consider the materials used to make it. This can affect nearly every part of your trip from the durability of the boat to the ride and overall weight. Look for a high end PVC or vinyl material. Both of these are lightweight while offering a durable long lasting skin. The overall weight of the boat should be another consideration. Even though tandem boats can hold two people comfortably you should be able to carry and set it up yourself. If you can’t get it to the water on your own you will not be using your kayak as much as you want. You can easily use the second seat to carry your gear instead of a person so this should be a key aspect of your buying decision. A maximum carrying capacity is another key aspect you should consider. It is recommended that a tandem boat have at least a 400 pound capacity. This will allow you and a friend to easily fit without worry. If you decide to take it out yourself you will be able to fit all your gear and still have room left over. Of all of the tandem kayaks on the market, we fell in love with the Intex Explorer K2 Kayak. A sit on top kayak has been designed with an open feel. Unlike closed kayaks your feet and legs are not confined making you feel claustrophobic. People with long legs will appreciate the open feel and will be able to move around without struggle. The flat space is perfect for summer days where you may want to jump in to escape the warm air. These are very versatile boats which can even be used for scuba diving or even a dinghy to get to your sailboat. Depending on what you’ll be using this kayak for there are features you should consider. Like any other kayak a carrying capacity will be at the top of the list. If you and your gear can’t ride above the water you won’t have a good time. If you are considering taking your children or pets out on the water you should look for a higher capacity boat. Storage for your belongings will be one thing that you should look at when considering a sit on top kayak. You don’t have to give up storage space to feel comfortable on your boat. Dry hatches are common which ensure your most prized possessions stay with you and most importantly dry. Bungee systems will also allow you to quickly grab items like a pre made lunch making your trip more enjoyable. Since they are exposed to the elements and surf water is bound to get into your boat. For this reason many boats will come with built in drain plugs ensuring you have a way of draining the water. Feel free to open them while you’re moving and let momentum carry the water out of your boat. These boats are excellent for any skill level. If you are just getting into the sport we recommend trying a sit on top style as you don’t need any special training if you face an emergency situation. If you have a closed kayak you would need training on how to properly execute an Eskimo roll if you happen to overturn your boat while you simply have to swim to the surface if you have a sit on top model. Of all of the sit on top kayaks on the market, we fell in love with the Intex Challenger K1. 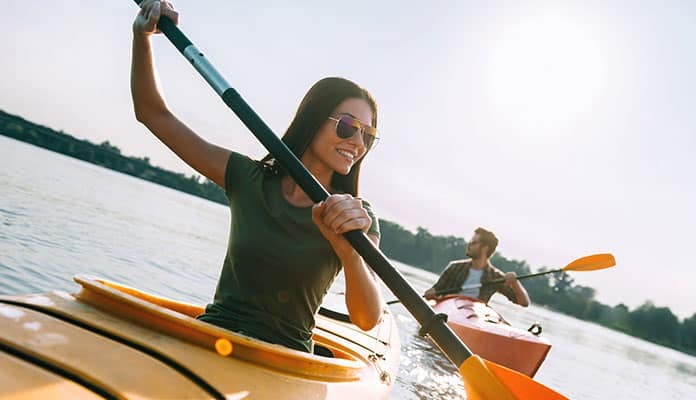 For those many paddlers out there who are looking for a kayak to just enjoy on weekends and for some potential longer trips you are looking for a pleasure kayak. This should take you from still to rough waters with ease. When looking for a recreational kayak it is important that you test it out. Comfort is key so finding a boat that has a high enough backrest as well as a spacious seat is important. Ensuring there is enough storage space is also important. Whether you have a love for photography, are planning a camping outing, or just in search of the perfect picnic spot you want the option to bring all your gear along with you. Having a kayak for camping that is both durable and gives you a stable ride is also important. 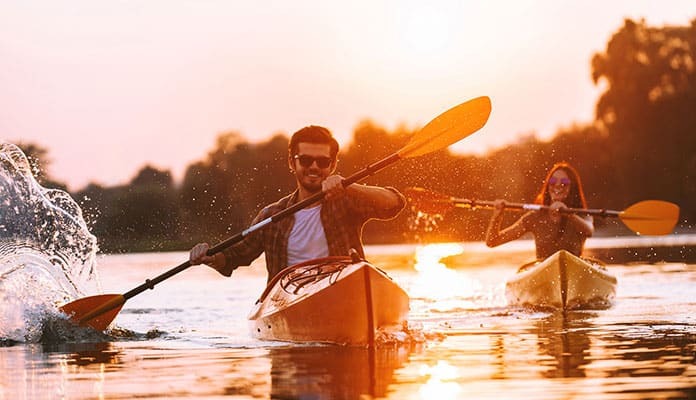 Kayaks come as an investment and can provide a lot of fun and a killer workout, but it is important that the money spent lasts you many years. These boats should be able to perform on still lakes but also handle themselves with some mild surf on rivers. Of all of the recreational kayaks on the market, our favorite is the kayak by Riot. The Boogie 50 transforms from calm lakes while holding its own expertly handling rough swells and ocean surf. If you are just entering the sport of kayaking we recommend looking at beginner kayaks. These are boats that have been designed to make learning quick and easy. Featuring things like added stability and balance will ensure you won’t have to worry about rolling your boat. Companies know the challenges and battles every new person has to face and does their best to minimize them. No matter if you are looking for a different way of exercise or just love the water kayaking is bound to impress you. Beginner kayaks are typically lightweight in design so that you will not need to paddle as hard when navigating through the water. Opting for a boat that has a stable design that will make you feel confident enough to stay out in the water for extended periods of time is important. As many beginners don’t know exactly what they will be using their kayak for, we recommend getting a kayak that can perform in any conditions. Typically you will start out in flat water but being able to handle some surf, especially on long distance paddles, will help you get the most out of your boat. The beginner kayak that sits at the top of our charts is the Intex Challenger. This kayak is durable enough to handle a beating while performing well in many different conditions. Touring kayaks are designed for long distance trips. Overnight camping trips are in range for these high tech kayaks. Their long thin shape allow them to cut through the water with ease while their long length allow them to brave the large swells of the ocean. Their versatility make them an excellent choice for intermediate to expert riders. They will be more difficult to control for beginners as they will be less initially stable which allows them to ride the waves and corner differently than others. This is due to their hull shape. Instead of a flat bottom like sit on top kayaks this has a more rounded shape which in combination with its pointy nose creates a low resistance boat. This rounded bottom allows the boat to keep its stability when it is in motion but makes it tippy when stationary. The best kayak for touring will be comfortable and built with lots of storage. The seat is a crucial aspect of comfort. If it is too padded it will not give any amount of stability in rough water. If it is too firm you will be uncomfortable from the start of your trip. A high-quality kayak seat will be fully adjustable by way of straps and belts that make it fit any sized person. Storage will include below deck compartments that ensure your most valuable stuff stay dry. Additional above deck storage will include a large bungee system that will strap your gear and dry bags for quick access. The cockpit is another aspect that adds to comfort for prolonged paddles. You should be able to sit in it comfortably with enough room around you to put a blanket for the coldest days. Your feet should fit with room enough to move them and not feel restricted. This is important if the worst case scenario happens where you tip your boat and need a quick exit. A high-quality boat will be made out of a fiberglass or kevlar material. Even though Kevlar is the highest quality material it is not used as much as fiberglass due to its high price. It is a super heavy duty build that will stand up to abuse of the shore no matter how rocky it is. Fiberglass is a less durable material but is easily repairable. A well-maintained boat can last more than a decade and be repaired when needed. It is a lightweight material that will allow you to get to the beach with ease and not strain your body with added weight. The most cost effective material is a polyethylene material which is essentially a plastic. This is a heavier option but will stand up to the dings of the shore for years to come. Ensure you store it in a covered environment as the elements, especially the sun, can cause it to deteriorate quickly. Of all of the touring kayaks on the market, we fell in love with the Riot Kayaks Edge 14.5 LV Flatwater kayak. When deciding to take to the open ocean it is important to note that you will need the top kayak for the ocean. An ocean fishing kayak will take on a much different shape than the rest because of the size of the ocean swells and the unpredictability of currents. It is important to get a boat that is long enough to handle the rough swells. These will be the longest of all the kayaks typically ranging from 15 to 20 feet long. You will also want a boat that will have enough stability to not tip when cornering and maneuvering. A rounded hull will be the best for this as it creates a boat that is stable and great at taking corners. Having a boat that has plenty of storage will set you up for the most successful fishing experience while on the water. this is more difficult to travel to and from shore so having everything with you will prove very beneficial. You want to opt for a board that is made from plastic that can withstand saltwater as it is often very harsh on materials. This will drastically increase the lifespan of your boat. Of all of the ocean fishing kayaks on the market, we can’t get enough of the Ocean Kayak Malibu. Built for the ocean this tandem kayak makes a great fishing boat. Many people love taking their fishing experience one step further. When looking for a river fly fishing kayak you will want to ensure yours can handle the unpredictable currents and surf with ease. Your ideal kayak for fly fishing will focus on stability giving you a smooth ride in unpredictable surf. A shorter kayak, around the 10 feet mark will allow you to maneuver through the waves with ease. Some kayaks will come with accessories such as paddle holders and even rod holders to sweeten the deal. We are always a fan of Sun Dolphin’s line of kayaks so it is no wonder their Bali SS is at the top of our list. How do you propel a kayak without using your hands? By using your feet. The pedal kayak has gained popularity over the years, spurring technology to advance at a rapid rate. Long ago are the days of pedal powered kayaks being the rental boats seen on ponds. These have transformed into boats you can take with you just about anywhere you go. Instead of the typical upper body workout you have come to expect with kayaking, this type of kayak works your lower body. It does this by incorporating a manually operated propeller underneath your kayak. Rather than being a leisurely day on the lake, you will feel the workout when opting for this type of boat. As this boat has much more technology built in, you can expect them to come in at a higher price point. Typically you would find entry kayaks starting at $1,000. 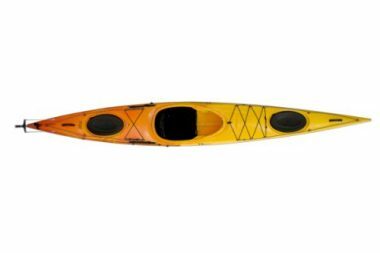 But for those that lack upper arm strength or tend to like higher speeds, this kayak may just be what you’re looking for. Pedal powered kayaks have become an increasingly popular style boat. Of all the ones out there, we love the Hobie Sport model. Perfect for fishing, this boat frees your hands so you can focus on reeling in your catch. Q: What’s Safer And Easier For One Person: Kayaking Or Canoeing? A: In recent years kayaking has begun to dominate the waterways with far more kayaks being used than canoes. For solo riders, kayaking is much easier than canoeing for a couple of reasons. The biggest reason is that kayaks are much lighter and easier to maneuver than canoes. The double sided paddle used for kayaking allows one person to gain full control maneuvering their kayak. They are generally much faster than canoes as well. Q: What Is The Best Beginners Kayak? A: This can be a tricky question because there are a few different types of kayaks. If you are looking for the best rigid sit in kayak the Sun Dolphin Aruba 10 Sit-in Kayak is a great option. Sit in kayaks help you to lower your center of gravity making them ideal for beginners worrying about falling in. A great inflatable ride on kayak is the Sevylor Quikpak K1. Being inflatable makes it ideal for storage and transportation as well as increases the lightweight design. The Intex Explorer K2 Kayak is one of the best beginner tandem kayaks if you find yourself wanting to go out with a friend. Q: How Hard Is Kayaking? A: Kayaking is a very popular sport for good reason. It allows you beautiful views of the water while adding in a great workout. 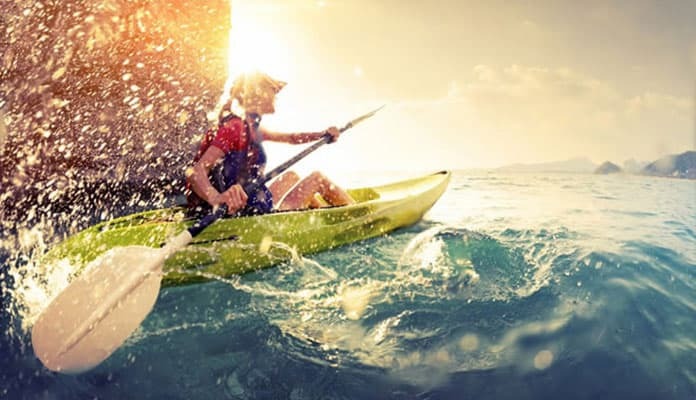 Building your upper body strength kayaking can be done lazily while casting a fishing line or provide a killer workout for speed and intensity. If you do not have a lot of upper body strength, there are pedal kayaks that allow you to incorporate your legs for a lower body workout. There is no rush when on the water so be sure to take your time to get your bearings and feel comfortable on the water. Q: What Are The Benefits Of A Kayak Over A Canoe? Q: What Are Some Tips On Kayaking? A: Don’t be afraid to dress up your kayak by adding some kayaking accessories. These can be anything from roof racks to fishing gear to seat supports. Personalizing your rig will help you get the most out of it. Be sure to pay attention to how you are holding your paddle. You will want to use both hands at just over shoulder distance apart. The goal is not to dig your whole paddle below the water’s surface for maximum power as it is with canoeing but rather to take light repetitive motions with both hands at a faster speed. Be sure your paddle is facing the right way with the concave part sweeping through the water in a scoop motion. Q: What Are Kayaks Made Out Of? A: Inflatable kayaks are typically made from heavy duty material that is resistant to punctures, dings and dents. This is typically a vinyl or military grade PVC material. Both of these are super durable while being lightweight and easy to fold. Rigid kayaks are usually made from a high strength plastic, fiberglass or even wood. Each of these has their advantages and drawbacks, but you will usually see kayaks made from plastic. These are the most cost effective material while also being quite durable. If you are looking for a lighter material fiberglass makes a great kayak material. Just keep in mind that this is also one of the more expensive options available. No matter where your travels take you the best kayaks will get you there. It is important to consider the type of boat that will work best for you. A long distance touring kayak will perform great during weekend trips, but not be the best choice for fishing or short trips. New to kayaking or have a top rated kayak on our list? Let us know how you like it in the comment section below.